A remarkable, wide-field infrared image allows to see in unprecedented detail the inner regions of RCW 108, a large complex of stars and nebulae in the southern Milky Way. It is one of the widest, "deepest" and most spectacular infrared astronomical images ever obtained of a starforming region. It is based on approx. 600 individual exposures with the SOFI multi-mode instrument on the ESO 3.58-metre New Technology Telescope (NTT) at the ESO La Silla Observatory (Chile). 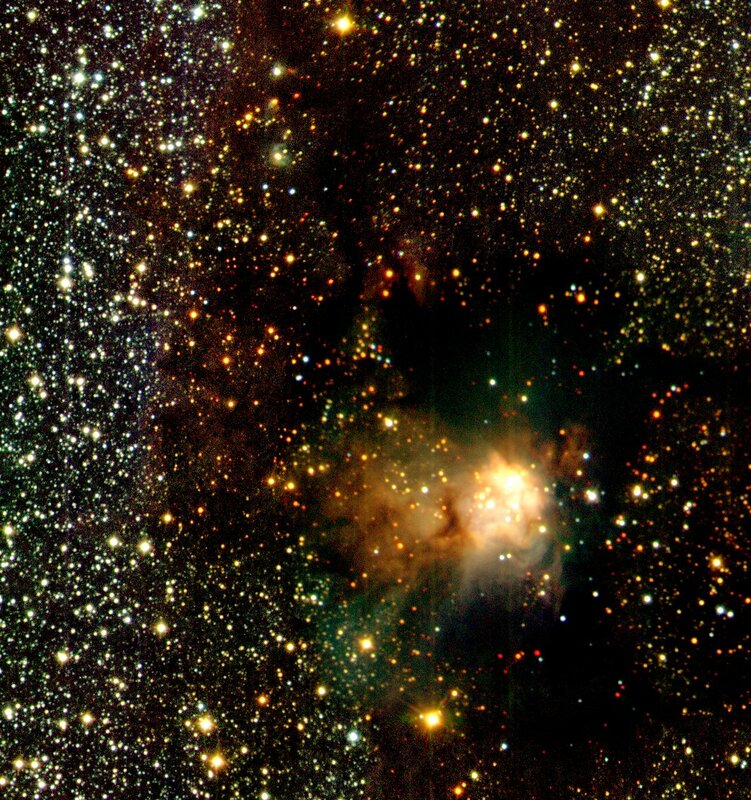 The above infrared view (ESO Press Photo eso0037a) of an interesting region in the Southern Milky Way, full of stars and nebulae and known as the RCW 108 complex, was obtained in February 2000. It provides a deep look into a star-forming region, where stars are in the process of being born from dense clouds of dust and gas. It is particularly interesting to compare the appearance of the area in this infrared view (SOFI) with that obtained earlier at visible wavelengths (WFI). As they look quite different, such a comparison is greatly facilitated by referring to the positions of the same brighter objects in the two photos. In visible light, the Eastern edge of the cloud appears as a bright rim; the same edge is present, although less prominent to the left in the infrared image. This is where the outer surface of the cloud is eroded and later completely dissolved by the strong ultraviolet light of a nearby cluster of stars, that lies beyond the edge of the infrared image. 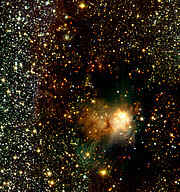 The bright nebula IRAS 16362-4845 at the center of the infrared picture is much more prominent here (see ESO Press Photo eso0037b) than in the visible one. This is because it is deeply embedded in the cloud and its visible light is heavily obscured by the dust particles. This effect is much smaller at longer (infrared) wavelengths, so the SOFI image provides a more detailed view of IRAS 16362-4845 . It is exactly this greater transparency of interstellar dust clouds in the infrared spectral region that is one of the main reasons why studies of very young stars are best carried out at infrared wavelengths. 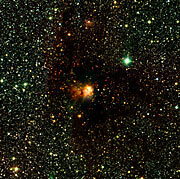 Such stars are often still surrounded by the remnants of their parental gas and dust clouds. Dust not only dims the light of objects located behind the cloud, but also "reddens" it. This is because shorter-wavelength (e.g., blue) light is scattered out of the line-of-sight more efficiently than is longer-wavelength (e.g., red) light. This effect is clearly seen in the SOFI image, where stars located within the cloud area on the average appear much redder than those that are outside. There are a few exceptions, however: some stars that are seen "in" the darkest part of the cloud appear to be blue. This is because they are located in front of the cloud or are only slightly embedded in it. In fact, since the "real" (i.e., intrinsic) "infrared colours" of most stars are rather similar, the different colours we see in the SOFI picture are mostly due to different degrees of reddening by foreground dust. The colour of a star in this area is therefore mostly a measure of how deeply it is embedded in the nebula. 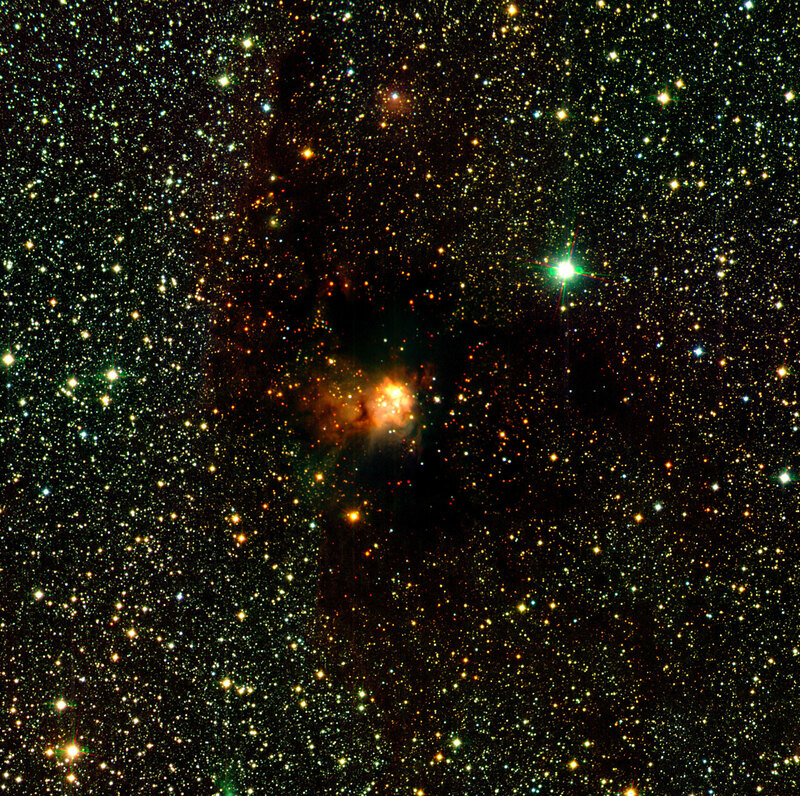 This SOFI image of RCW 108 was obtained by ESO astronomer Fernando Comeron for one of his current research projects. He also performed the related, very extensive image processing.